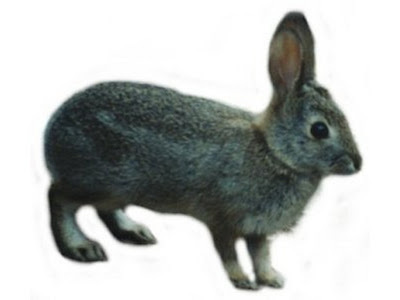 Amuleto Mexican Table, Mezcal Vago & "A Slap To The Face"
Were you listening to the 400 Rabbits yesterday? Those Rabbits & I encouraged people to drink more mezcal, to experience the diverse and complex wonders of this agave distillate. You probably know plenty about tequila but you might know little about mezcal, and what little you might know could be merely the myths of mezcal. However, the more you learn about mezcal, I suspect you will find a myriad of reasons why you should be drinking it. Today, let me give you some specific mezcal recommendations, excellent examples of the potential of mezcal. 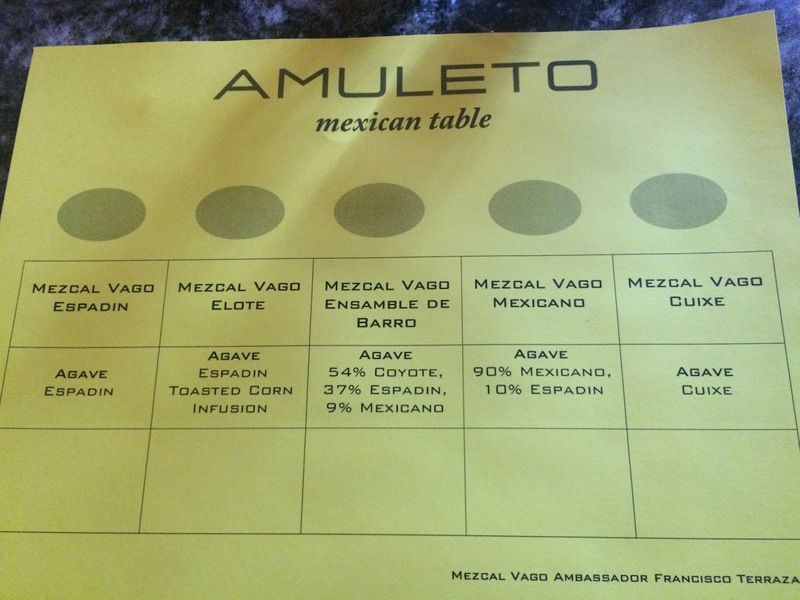 Last summer, Amuleto Mexican Table opened on Moody Street in Waltham and recently hosted their first Mezcal Tasting. Though I've heard some good reviews of Amuleto, I hadn't yet dined there but was interested in checking out their mezcal tasting. The tasting cost $25, which included samples of 5 Mezcals from Mezcal Vago along with some small bites. The event was well attended, lots of fun, and the accompanying food was tasty. My only minor issue is that I thought, based on comparably priced events elsewhere, that the size of the mezcal samples could have been a bit larger. As it was their first event though, and they are still learning, it could be remedied in future events. 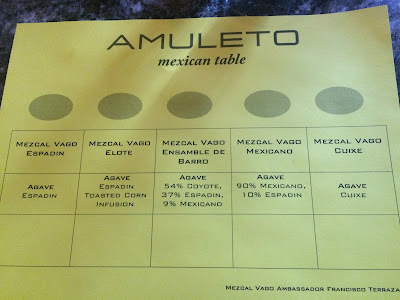 I am impressed that Amuleto is such a passionate advocate for mezcal. They currently stock over 20 mezcals, from 7 producers/importers, with glasses priced from $9-$34. There are few other local restaurants and bars with that many mezcals so Amulet is a true prize. If you want to sample a few different mezcals, you can order one of their six mezcal flights of three tastes, priced $18-$49. In addition, they make numerous mezcal cocktails, $10-$11, including the Oaxaca Old Fashioned (Mezcal, Agave Nectar, Bitters) and Mezcaloco (Mezcal, Coconut Cream, Pineapple Juice). In the future, they will hold other mezcal tastings and maybe even a mezcal-paired dinner. And I love their cow painting (seen above) which is located near the window into the kitchen. The mezcal tasting was led by Francisco Terrazas (pictured above), the brand ambassador for Mezcal Vago, who also used to run a Mezcal bar in Houston. Francisco was energetic and knowledgeable, with a clear and deep passion for mezcal. He interacted well with all of the tasting attendees, answering their questions and helping to maintain a high energy level at the event. He discussed some basics about mezcal, as well as more specifics about the two mezcal distilleries represented by Mezcal Vago. Mezcal Vago was founded in 2013 by friends Judah Emanuel Kuper & Dylan Sloan. Approximately 15 years ago, they traveled to the region of Oaxaca and tasted Mezcal for the first time, having a revelatory moment. They loved the region, were intrigued by mezcal and eventually started a small beachside bar on an island west of Puerto Escondido. Judah married a nurse named Valentina whose father, Aquilino Garcia Lopez, made mezcal and whose family had been producing mezcal for at least five generations. Judah and Dylan saw an opportunity, to introduce Americans to some of the artisanal mezcal that was being produced by small Oaxaca producers. Much of that mezcal wasn't yet being exported, consumed only by locals. They currently work with two producers, Aquilino Garcia Lopez and another related producer, Salomon Rey Rodriguez. Their mezcals are available in 22-23 U.S. states and that will grow in the near future. All of the Vago mezcals are naturally made, in a traditional palenque, without any additives. They are also joven, meaning that they are not aged. It isn't traditional for them to age mezcal though Francisco stated it is for some other producers. They have done a little experimentation with aging, especially in clay vessels, but haven't released any aged products. It is cool that the front label of each bottles contains plenty of info about the mezcal, including: the name of the agave variety, name of the producer (the mezcalero), name of the village, the method of grinding, the type of still, name of the parcel, batch size, distillation date, and age. The alcohol content is also listed and it should be noted that the alcohol content will vary from batch to batch, though not significantly, even for the same agave variety. Francisco mentioned that they are still learning about agave. I think that is a very important point, that the full potential of agave and mezcal has not yet been realized. Mezcal production can only improve, creating something that is even more compelling. There is still plenty of room, as well as need, for experimentation and study, to enhance and improve the mezcal process in so many different ways. We need to give our support to those expanding our knowledge of agave and mezcal. In Oaxaca, a traditional accompaniment with mezcal is a plate of orange slices and sal de gusano, worm salt. This is not euphemism and actually is made with crushed worms, along with some salt and chili powder. The orange and salt are intended to be a palate cleanser while you sip the mezcal. Though we didn't have any sal de gusano at our mezcal tasting, Francisco brought something equally as good, sal de chapulin, which is grasshopper salt. It was salty and spicy, with a slight nutty accent. And you never would have known it contained grasshoppers unless someone told you. Five mezcals were served at the tasting, from the two different distilleries. A bottle of Mezcal Vago generally costs $50-$125 retail, dependent on the variety and rarity. These are reasonable prices considering several factors, such as the laborious efforts that go into producing this mezcal, as well as the rarity of some of the agave varieties. In addition, remember that the agave can take 7-25 years to mature and dies after it blooms. Aquilino Garcia Lopez has started producing mezcal for the first time on a commercial basis and they are exclusive to Mezcal Vago. They grind their agave with a traditional tahona, which is pulled by a horse named Señor Pancho. For roasting the agave, they used a combination of Sabino, a type of pine, and fallen cactus ribs. They also have seven pine wood vats and a copper still. Aquilino usually leaves a little residual sugar in the fermentation vat so the mezcal doesn't get too acidic. Aquilino’s mezcals are supposed to possess a definite style: "Bright, clean and bold without too much smoke." Salomon Rey Rodriguez, known as Tio Rey, has also started producing mezcal for the first time on a commercial basis and they are also exclusive to Mezcal Vago. Instead of a tahona, they crush the piñas, with 40 kilogram wooden mallets known as a mazos. Tio Rey has 4 fermentation vats, including one made from a 900 liter trunk of a pine tree which has been in use for over 90 years. For distillation, he uses clay pots, known as Olla de Barro. The whole production process is long and laborious, taking about four times as long as that of Aquilino. We began the tasting with the Espadin produced by Aquilino Garcia Lopez in the small village of Candelabra Yegole. About 75% of all mezcal is made from Espadin, which is the genetic mother of Blue Weber Agave. It is easy to cultivate, matures in 7-12 years, and has a high sugar content. In addition, it grows small clone plants in about 3-4 years which can be replanted. That is good in some ways, but also has a potential problem for being monoclonal, which could lead to plant diseases and more. For Aquilino, on average, an Espadin will yield seven bottles of Mezcal and the average batch size is about 750 liters. I found this Espadin to have clean flavors with pleasing citrus, some herbal accents, a hint of caramel and a mild touch of smoke. Easy drinking and smooth, this would make for a nice introductory mezcal which should appeal to a wide audience. The Elote, also produced by Aquilino Garcia Lopez, is made from Espadin but roasted corn is added during the second distillation. Sun dried corn kernels are toasted on a clay comal before being placed into the still. With a mild smokiness, the sweetness and flavor of the corn is prominent, enhanced by some herbal, citrus and honey notes. This would be a nice introductory Mezcal, as the smokiness is restrained and the slight sweetness makes it a bit more mellow. For Mezcal lovers, it presents a more unique taste profile which should intrigue and satisfy. One of my favorite mezcals of the evening was the Mexicano, also produced by Aquilino Garcia Lopez. Also known as Maguey de Monte, the Mexicano is a wild naturally growing agave and yields a little less than seven bottles of Mezcal. As Mexicano can be very delicate, Aquilino added 10% of Espadin to this batch to provide it a little body, especially on the finish. I found this mezcal to be elegant and complex, with a compelling melange of flavors including a stronger smokiness, some roasted agave, caramel, and hints of stone fruit. It was smooth, well-balanced and delicious, an excellent mezcal to slowly sip and savor. Highly recommended. The Cuixe, also produced by Aquilino Garcia Lopez, is made from the Cuixe agave, a wild sub-variety of Agave Kawinskii that is indigenous only to a small area of Oaxaca. It takes a lot of time to scour the countryside seeking ripe agave, and some, located atop mountains, must be brought down by burro. It also takes extra effort to clean, prepare, grind and roast the Cuixe. Aquilino only makes two small batches of Cuixe each year. This mezcal possesses more of a smell of fresh hay and was very dry on the palate, with a mild smokiness and more prominent herbaceous flavors. It certainly had a more unique flavor than the previous mezcals we had tasted. The Ensemble en Barro was produced by Salomon Rey Rodriguez and it is a blend of agave varieties, including Espadin, Mexicano, Coyote, Arroqueno, and Sierra Negra. The blend will vary with each batch. This was distilled in clay pots in a small batch of 180 liters. This was another smooth, easy drinking and delicious mezcal with a pleasing taste of citrus and banana, with a slight smoky edge and some herbal accents. There is also a subtle earthy undertone which serves to add complexity and flavor to the blend. You don't get much more artisan than the mezcals of Tio Rey. After the tasting, Francisco shared a couple other mezcals with a few of us, more small batches which are no longer available. The first was the Tepazate, produced by Aquilino Garcia Lopez, and it was my top favorite mezcal of the evening. The Tepazate agave, also known as Dub-Cual, is a wild variety which grows quite large and can take as long as 25 years to mature. This mezcal had an impressive and complex taste, with lots of smoky and earthy elements, plenty of herbal notes and hints of citrus and stone fruit. I could have sat there for hours sipping this mezcal, extracting subtle hints of other flavors as well. This is one of Francisco's favorite mezcals and it is easy to understand why. Highly recommended. Lastly, we tasted the Coyote en Barro, produced by Salomon Rey Rodriguez, and note that a 100% Coyote agave mezcal is very rare. This mezcal had a mild musty aroma with an intriguing taste of a mild smokiness, strong briny elements, bright citrus and a light earthy touch. Kudos to Amuleto Mexican Table, Mezcal Vago and Francisco Terrazas. They are spreading a passion for mezcal and their passion is infectious. It was clear at the event that most of the attendees were impressed with the mezcals and would be seeking them out in the future. Mezcal Vago is importing some intriguing and delicious mezcals, which though they are not inexpensive, they are definitely worth the price. These are artisanal products, produced in traditional methods by small family distilleries. I strongly recommend you seek out the mezcals of Mezcal Vago. New restaurants often evolve over time, expanding and revising to elevate the quality of their customer's experiences. Ciao! Pizza & Pasta, my Favorite New Restaurant of 2015, opened last September and has been serving some of the best house-made pasta and wood fired pizza in the Boston area. On a regular basis, they change some of their menu items, letting Chef Marvin Posada design some new culinary creations. In addition, they have been instituting other changes over time, such as partnering with Mystic Brewery, to provide food for people who visit their taproom. Most recently, the front of the restaurant has seen a redesign, pushing the original counter a few feet back into the kitchen and adding a couple more seats, as well as changing the type of chairs. There are now eight seats inside the restaurant, and the front is much roomier, accommodating more people who might be standing, waiting for their to-go orders. Outside, as soon as the weather permits, they will be opening a small patio, increasing the number of people who can dine here. I like sitting at the counter facing the kitchen, having the ability to watch Chef Posada and his team working. Ciao! also recently received a Wine & Beer license, and they have started carrying some wines. Once their list is complete, they will carry 5 White wines, 5 Red Wines and 5 Beers (including some from Mystic Brewery). The wines will generally cost $6-$8 a bottle and there will be a variety of grapes and countries represented. For example, you might fine an Italian Chianti or a Malbec from Argentina. I like being able to have a glass of wine with lunch or dinner, especially with pasta or pizza. Earlier this week, I stopped by and had a glass of Chianti with my favorite pasta dish, their House-made Campanelle with Chorizo Bolognese. Food & wine, a work of art. One of their newest dishes is the Creste Di Gallo, house-made tomato infused pasta, with aglio olio, zucchini, basil, & parmigiana reggiano (though I omitted the zucchini). The little crescent pasta was delicious, with a savory tomato flavor. It was a taste of the garden. And one of their newest dishes, which will soon be on their menu, is the Shrimp Bruschetta. Their bread dough is used to make the long, loaf of soft and crusty bread. It is topped by an ample amount of plump shrimp in like a scampi sauce, with large cloves of garlic confit. Another winner. I continue to rave about Ciao! Pizza & Pasta because it is a consistently excellent restaurant and worthy of the attention. I haven't dined there with a friend who hasn't loved it. They are creating some of the best pizza and pasta in the Boston region. If you haven't visited it yet, then make plans to do so and I'm sure you'll love it. Previously, I reviewed the intriguing Greek spirits that are served at Committee, a new Greek/Mediterranean restaurant in the Seaport district. However, I haven't yet written about their cuisine, except for several positive mentions on Facebook and Twitter. I've now visited Committee on three occasions, each time being impressed with their cuisine, from their homemade Hummus & Pita Bread to their hearty Poikilia Kreaton, a sumptuous platter of grilled meats. Consulting Chef Diane Kochilas has created some amazing dishes which have been well executed by the Committee kitchen staff. I'll definitely be returning there, to experience more of their delicious cuisine. Committee has recently begun offering Brunch service, on Saturdays and Sundays, from 11am-3pm, and this past weekend I dined there as a media guest. The menu is an intriguing mix of dishes, with a Greek twist on several usual breakfast dishes. The menu includes 3 Breakfast Pies ($5-$6) which were inspired by Greek street food, 12 Meze ($6-$16) such as Feta Saganaki, Grape Leaf Dolmades, and a Greek Cheese Plate; 8 Breakfast options ($9-$14) such as Greek Yogurt Pancakes, Tsoureki French Toast, and Baklava Oatmeal; 6 Lunch options ($12-$16) such as Artichoke Moussaka, a grass-fed beef Burger, and Spanakopita Grilled Cheese. And if you want to share breakfast, you can order the Shakshouka ($24), which serves two or more guests. There is plenty of diversity on the menu so it will appeal to whatever your preference. I also feel the menu is reasonably priced for the quality and quantity of the food. There is a nice balance of traditional Greek dishes with some more unique Greek inspired twists. Though it was only their second weekend of brunch service, the restaurant was fairly crowded and I'd recommend you make reservations to ensure you get a table and don't have to wait. Above, is a small cup of Greek Coffee ($5), black, dark and strong. It'll help to wake you up early in the morning. Their variation on the Bloody Mary is the Bloody Marietta ($10), made with vodka, olive tapenade, EVOO, rigani, basil, Tabasco, and a spicy feta stuffed olive. It was a savory and delicious variation, with intriguing olive notes, a mild spiciness and seemed lighter than other such cocktails. It went down very easy and makes you crave another. The Pigs & Booze ($14) is made with bacon washed bourbon, maple syrup, orange & chocolate bitters, & candied bacon (though the candied bacon seemed to be missing from this cocktail). Despite that omission, the drink was smooth and delicious, with a subtle bacon and smoky element. It wasn't overly sweet and the orange and chocolate notes were mild, accenting the drink without taking over. The Santorini Soda ($12) is made with Keel vodka, ouzo, vanilla, grapefruit, lime, and soda water. Ouzo cocktails aren't found in many places but based on this example, maybe they should be. The mild black licorice flavor blended well with the grapefruit and hint of vanilla. It was refreshing and bright, and even if you're not a huge fan of back licorice, I'd still recommend you sample this cocktail. This might make an interesting slushy. Everyone receives a basket of complimentary Breakfast Bread, accompanied by butter or jelly, and bread has cranberries. It is a little sweet, with citrus accents and a mild tartness. I tried two of their Breakfast Pies, including the Bougatsa ($6), which is made with phyllo, custard, ground cinnamon, and powdered sugar. Buttery, flaky phyllo holds a sweet and creamy custard which makes for an excellent sweet treat. And with two pieces, you can easily share. Another of the Breakfast pies is the Tyropita ($6), made from phyllo, feta, kasseri, vlahotiri, and rigani. Kayseri & vlahotiri are Greek cheeses while rigani is Greek oregano. So, this is essentially a cheese pie and the phyllo was again buttery and flaky, and the savory and salty cheeses were creamy and delicious. This was certainly one of my favorite dishes of the entire brunch. One of the Meze is Souvlaki ($16 ), two skewers of marinated lamb with rigani, lemon, and tzatziki sauce. The lamb was tender and savory, with a nice blend of spices and herbs. As a lamb lover, Committee earns my hearty kudos as every lamb dish I've eaten here has been excellent. For example, the Lahmajun (on the dinner menu), is basically a ground, spiced lamb pizza on a pita and it is superb. For Breakfast entrees, the Classic Greek Omelet ($14) is made with spinach, dill, scallions, & feta, and is accompanied with patates tiganites and grilled pita. Light and fluffy, herbal and salty, it brought a nice balance of savory flavors. The Breakfast Gyro ($14) comes with eggs, grilled haloumi, loukaniko, and florina pepper sauce, wrapped in pita, and served with patates tiganites. They asked me how I wanted my eggs and I went for over easy, wanting a runny yolk. Yes, that made the sandwich a bit messy so I used a knife and fork. However, I loved the taste, with the fluffy pita bread, the nice texture and salty edge of the halloumi cheese and the spices of the loukaniko sausage. The pepper sauce added a nice savory element. They didn't skimp on the fillings for the pita and if you ordered scrambled eggs, you probably could have eaten it with your hands. Overall, Brunch was delicious and I want to return to check out more of their offerings. Service was very good, consistent with my previous experiences. Consistency has also been a common element for their cuisines and drinks. Committee is an excellent restaurant to experience more traditional Greek cuisine, wines and spirits, but also for more modern and inventive variations. It has become one of the highlights of the Seaport district, a non-chain restaurant with compelling food and drink, all at a reasonable price. Check them out for dinner, lunch, brunch or one of their wine dinners. It was my Top Restaurant Experience of 2015. The restaurant has garnered many accolades from the local press and has even gained national attention. Chef Peter Ungár and his Tasting Counter deserve all of the attention and more. The cuisine is inventive, appealing and absolutely delicious. The setting is cool and intimate, a twenty-seat counter where you can also watch the chef and kitchen staff preparing your food. And they charge one reasonable price, which includes food, drink, tax and tip. Recently, the Tasting Counter has started serving a three-course Lunch every Tuesday, Wednesday, and Thursday, from 1pm-2pm and his team will select dishes from the nightly tasting menu, including a pasta course, meat or fish plate, and dessert (with dietary restrictions accommodated). And the menu will change daily, so there will always be something new. Lunch also includes four courses of beverage, your choice of Sake, wine, beer or nonalcoholic, and it costs only $55, which includes tax and tip. (Try something different and opt for the Sake!) You just have to make your reservation through their online system. This is a less expensive way to check out Chef Ungár's culinary skills and I'm sure that after lunch it will convince you to check out dinner as well. Chef recently invited me to sample the Lunch menu so I wanted to present a glimpse into what you can expect from such a Lunch. I opted for the Sake pairing (no surprise there), though they have a new Beverage Director, Eileen Elliott, who has selected some very intriguing wines, including Cider from Switzerland. They also have a delicious Travessia Rosé on tap, as well as Dovetail Nakahama Junmai Sake on tap. Lunch began with a few Welcoming Bites, intriguing tidbits with lots of complexity and taste. They included Fluke, sake, rice; Rhubarb, almond, black rice; and Ocean trout, sesame, grapefruit. A beautiful presentation and an excellent way to awaken your palate for the rest of the lunch to come. The First Course was Hand Rolled Seaweed Pasta with lobster custard, hen of the woods mushrooms, sea urchin and wakame. A potent dish of umami, it provides a taste of the earth and sea with some sweetness from the custard and briny notes from the sea urchin. Very impressive. To cleanse your palate, you receive Schisandra Berry, a cold brewed tea which was sweet and salty, sour and bitter. I really want to make a Sake cocktail with this tea. The Second Course was Hake with miso torch, beluga lentil, enoki, and charred leek. The sweet, flaky fish was complemented by the smokiness from the leeks, the savory lentils and earthy mushrooms. The Dessert Course was Chocolate, covering a sponge cake and accompanied by two sauces: milk jam and preserved orange. A rich chocolate layer covered the moist sponge cake, enhanced by the creamy milk jam sauce and strong citrus of the orange. Finally, you receive a few Parting Morsels, which included a green tea meringue; blood orange chew; and foie gras bonbon. Again, little bites with powerful flavors, ensuring you leave on a positive note. Overall, you receive plenty of food for lunch, though you won't leave feeling bloated. Chef Ungár creates compelling and complex dishes, which also impress with their beauty. I highly recommend you check out Tasting Counter for lunch or dinner. And give the Sake a try. As a matter of full disclosure, I consulted on their Sake program & they possess the largest Sake menu of any non-Asian restaurant in the Boston area. Currently, I am working with them to redesign the Sake menu, to bring some new and exciting Sakes to their list. Are restaurants lying to their customers about the sourcing of their ingredients? That question is on the minds of many due to a fascinating recent article that came out of Tampa Bay, Florida. Links to this restaurant article have been rampant on social media. It has garnered much praise, being extolled as an excellent piece of investigative journalism. Though the article is about the restaurant scene in Tampa Bay, it touches on issues that potentially exist all over the country. Laura Reiley, the food critic for the Tampa Bay Times, wrote a three-part series on "local" food, touching on restaurants and farmers markets. The first part of the series is "At Tampa Bay farm-to-table restaurants, you’re being fed fiction" and it has taken the restaurant scene by storm. Ten Tampa Bay restaurants were found to have made "...false or inaccurate claims about the source of the food on their menus." Some of those restaurants claimed to have used specific local purveyors though the evidence showed those claims to be untrue. Others claimed to have used local seafood when it actually came from China. The litany of their false claims is lengthy. It raises the issue of whether local restaurants in other cities commit similar offenses. It is easy to believe that Tampa Bay is not an outlier, that it is but an example of a greater problem confronting our national restaurant industry. However, we should be asking another initial question which seems to have been largely ignored concerning this matter. Should we trust Laura Reiley? Plenty of people are sharing and praising her article but how many of those people have tried to verify the accuracy of her investigative report? How many have taken the time to follow-up on her claims at those Tampa Bay restaurants? The answer is that few, if any, have done so. They have simply assumed the article is accurate, praising it and passing it on to others. It is certainly interesting that people are willing to fully trust an article about people who are lying to the public. Please know that I am not saying that Laura Reiley's article is false or inaccurate. However, we need to look at all such articles with a critical eye. That is part of her article's point, that we shouldn't just accept all claims at face value. We cannot assume their validity simply because they exist and feed into our existing biases and points of view. We need to question and scrutinize all such claims. The same way we should be doing so with restaurants that make numerous claims, including on their sourcing. If we fail to question the accuracy of Laura's article, then we fail to understand one of her major points. There are good reasons to accept the validity of Laura Reiley's article, especially because of all the details she has provided, details which could be either readily verified or disproven with ittle effort. She didn't make vague claims which would be hard to verify or deny. She was blunt, clearly identifying the offending restaurants and providing specific examples of their misdeeds. She has placed all of her integrity on the line. I haven't seen any article yet online which disputes any of her claims. So, if we accept her article as valid, what is the next step? Which questions must now be asked? Well, if Tampa Bay restaurants are lying about their sourcing, are there Boston restaurants which do the same? And if so, how do you determine which ones are committing that offense? For the average person, that would be a difficult task. They don't have the time and resources to devote to verifying the claims of all these restaurants. Even many writers don't have the time and resources to devote to a thorough review of a significant number of restaurants. It is primarily print writers who possess the necessary resources for larger restaurant industry investigations. For everyone else, it often becomes merely a matter of trust. You can either choose to trust a restaurant's sourcing claims or not. If a restaurant states they use produce from a specific local farm, who is going to visit that farm to verify the restaurant's claim? Who is going to ask the restaurant for invoices to prove their claim? Probably no one. And even if someone did this for a single restaurant, they probably wouldn't be able to invest the time and effort to do so for a dozen or more restaurants. Instead, we must rely on trust, which could be misplaced, but there isn't much else we can do. If a writer reviews a restaurant, they generally take many sourcing issues on their face, trusting the restaurant is providing them accurate information. The same applies in related industries, such as the world of wine. You accept the producer's words as to where they source their grapes, how they produce their wines, and more. Readers don't expect them to thoroughly investigate all of those claims to prove their veracity. Maybe someone though should do so. Questioning the veracity of such claims isn't easy and can earn you enemies. In the past, I have questioned the accuracy of claims made by a few restaurants, vendors and others. My probing led to ill will from some of those I questioned, though that never caused me to compromise my principles. I don't have the resources to engage in an investigation on the level of Lauren Reiley, but I have taken some small steps in that direction. And if enough writers did the same, the cumulative effect would benefit all of us. Be wary of who you trust. Not everyone, especially those in business, tell the truth all the time. Restaurants who make claims about their sourcing may not be providing accurate information. I encourage writers to make an effort sometimes to delve deeper into sourcing matters, to ascertain which restaurants are being true. Kudos to Lauren Reiley for helping to ignite this discussion. Since its opening in 2010, AKA Bistro, in Lincoln, has remained one of my favorite restaurants, a suburban gem which is located only a few minutes off Rt.128. It offers both French bistro cuisine as well as creative Japanese fare, especially innovative sashimi dishes. They source much of their ingredients locally and the seafood is always fresh. They serve lunch, dinner and brunch so there are plenty of opportunities to check out their menus. One of my favorite dishes is their Moules Frites, the mussels within a compelling broth in which you should dip your crusty rolls. You might even just want a straw (which they actually provide for the broth in one of their Steamed Clam dishes). Their Miso Soup is one of the best I've ever had, putting to shame the thin, lackluster miso soups you find at a number of spots. Their wine list is strong on French wines, including Alsatian, and they also have a small, but well curated section of Japanese Sake. If you haven't been there yet, I highly recommend you check it out. There were suggested wine and Sake pairings for each dish, and if you opted for all of those pairings, it cost about another $100. However, you could also choose just a few of the pairings, each which were separately priced. Some of selections included wines and Sake that were not usually available by the glass. I opted to get a bottle of Kubota Senju Tokubetsu Honjozo Sake ($58), a clean, dry and aromatic Sake that would pair well with the various Sushi dishes. The event was held in the main dining area and the Chefs worked at one end of the room, fully visible to all of the diners. It was fascinating to watch the intensity of the chefs as they worked, to see the care and attention that went into each dish. They seemed to be perfectionists, ensuring that each dish met their strict standards. They made sure that each piece of nigiri had the proper ratio of rice for the size and type of the topping. Both Chris and Youji bring many years of sushi experience to the table and their exquisite skills were more than evident in the dishes that we were served. Most of the Sushi dishes were Nigiri ('hand-pressed"), seafood or other items atop vinegared rice. However, each dish was more creative than just a piece of fish atop rice, adding other flavors and textures to elevate the dish. The fish and other main toppings still were the stars of each dish, but they had costarring additions to make each bite even more compelling. The freshness and quality of the toppings were evident and not a single dish was a failure. The dinner provided plenty of diversity and complexity, and I craved seconds of all of the various dishes. I'm not even sure I could choose a single favorite from all those tasty plates. Chef Chris Chung, on the left, and Assistant Sushi Chef, Philip Wolfe, on the right. We began with an Amuse Bouche, Hand Crafted Tofu with uni, mirin sabayon, and dashi soy. A well balanced dish of creamy tofu, briny uni and the umami of the dashi soy. It reminded me of the salty foam of the sea, an excellent starting point for all of the seafood which was soon to come. Next up was a Takiawase (appetizer), Sake Steamed Local Clams with white wine glacé, morel & fresh bamboo shoots. The broth was savory and stellar, though I expected it would be as AKA Bistro has always done a great job on broths with shellfish, from mussels to clams. You had to consume every bit of the broth as it was just that delicious. The tender clams were in contrast to the crunchy bamboo shoot, which added a little bitterness to the dish. We moved onto our first Sushi dish, Kama Toro, which is part of the tuna around its collarbone. The Kama is high in fat, making it very tender, and its flavor is more concentrated that most other parts of the tuna. As this is a rare cut, it was a special treat. This Kama was marinated yakiniku, grilled over bincho tan, with nikiri-soy (a sweet soy sauce). This sushi was lightly warm, melted in my mouth like creamy butter and there was a light sweetness to the intense taste of the tuna. Simply superb. This was far above the usual tuna you have at sushi restaurants. The Cured Sawara, which is Spanish Mackerel, was made with hibiscus vinegar, house made ume, and Okinanawa black sugar. In contrast to the Kama, this fish had a firmer texture and was a bit more oily (in a good way). There was also a nice contrast in this dish of the vinegar with a little sweetness. Another tasty Nigiri. The Mategai, which are Razor Clams, were accompanied by a Shichimi Togarashi cured Meyer lemon slice. The meaty razor clams had even more texture and were chewier, though not in a bad way. They possessed a clean taste, enhanced by a bit of lemon, and the slight saltiness of the nori. The first three Sushi dishes offered a nice progression of textures and tastes. The Bincho Maguro, which is Wild Albacore Tuna, was minute marinated in zuke-soy and fresh horseradish. Silky tuna, with a spicy kick, it had a texture closer to the Sawara. An excellent piece of tuna, far better than the average maguro you find in many other spots. The presentation for this dish, Seared Hangar Steak, was cool as the glass held in the aromatic smoke. The steak was accompanied by black lava salt, burnt rosemary scent, AA choy (a Chinese vegetable also known as Taiwan lettuce), and blood orange kosho (a salted cured condiment). This was a Steak Nigiri, sitting atop vinegared rice. The beef had a smoky edge to it, with a strong flavor of rosemary, and nice acidity from the kosho. The beef was tender, with a nice texture, and it made for an interesting diversity after several dishes of seafood. The Maitake Mushroom Mini-Musubi was sautéed in garlic oil and that atop toasted nori. We were told to roll up the nori, making our own little hand roll. It was savory and salty, with lots of umami and a hint of toastiness. A nice blend of flavors. The Poached & Seared Monkfish, with shio koji (a seasoning) and brown butter, was topped by what seemed to be a pickled onion. The tender and lightly sweet monkfish was enhanced by the crunchy onion. The taste was clean and light, with savory notes giving some umami to the dish. The Gyoku, Edomae Tamago, is essentially an egg omelet and was accompanied by truffle butter and sakura blossom salt. The truffle butter was like a powder atop the tamago. The rich and slightly sweet egg taste was enhanced by the umami-rich truffle taste and a mild saltiness. Definitely one of the top tamago dishes I've ever had. Our last savory dish was Wan, a Noodle Soup, of Homemade Soba with salmon caviar and yam julienne. The aroma of this dish was so alluring and the taste delivered on those aromas, presenting an enticing savory broth, with the saltiness from the roe. The noodles had a good consistency, with just the right amount of bite to them. The yam slices added a bit of crunch to the dish, and also helped to cleanse your palate. The final dish, which I didn't get a photo, was the Dessert, the Choux à la mode, basically an ice cream puff with azuki and amazake ice cream. Sweet and creamy, with a flaky pastry shell, it was a pleasing finale to this stellar dinner. Overall, this was a stellar dinner and each and every dish succeeded. The diversity of ingredients, textures and flavors delighted the eyes and the palate. Kudos to the chefs for all of their hard work in creating this sushi dinner. Chef Chris Chung has also told me that they will be doing another Sushi popup in the future so I strongly encourage my readers to attend the next event. And if you haven't been to AKA Bistro yet, you should also check out their usual menu.